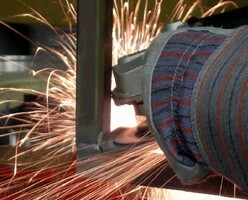 Trimmable Abrasive Flap Disc ranges from 40-120 grit. Trimmable Cyclone(TM) features composite backing that can be trimmed up to 3/8 in. from original diameter, extending life of disc. By trimming backing material away, flap length is extended, enabling operator to access hard-to-reach areas such as right angles and irregular shapes. Non-marking backing will not damage work-piece. Made with zirconium abrasive grain, Trimmable Cyclone is available in 2.5 in. diameter with 7/8 in. or 5/8-11 arbor. Meet the Newest Member of the Anderson Cyclone Family! A new member has joined the Anderson Products family of Cyclone(TM) Abrasive Flap Discs - the Trimmable Cyclone! The composite backing can be trimmed up to 3/8" from the original diameter, dramatically extending the life of the disc. The trimmable backing allows for more flap flexibility. By trimming the backing material away, the flap length is extended. This enables the operator to access hard-to-reach areas such as right angles and irregular shapes, and grind on-edge without changing tools, increasing productivity. The non-marking backing will not damage the work-piece, resulting in less re-work and scrap. The Trimmable Cyclone is made with zirconium abrasive grain, and is available in 4.5" diameter with either a 7/8" or 5/8-11 arbor. Grit sizes range from 40 to 120. Anderson has produced a new brochure featuring their full line of Cyclone coated abrasive flap discs including the new Trimmable Cyclone. Remember, flap discs grind and finish in one easy step!